This is the BEST POST EVER! …well, I mean, it’s fine. Opinions are like bellybuttons: everyone’s got one. I recently mentioned the AppleWatch to a friend, and before I could finish my sentence, he said, “Oh my GOD! The AppleWatch is SO dumb! Why would anyone want something so useless and so expensive? !” I was caught off guard—I was about to mention something I like about the watch, but all of a sudden I felt like I couldn’t say anything positive about it. Everyone is entitled to their opinion. And everyone has the right to express their opinion. But there are lots of ways to express your opinion, from a brief mention to a forceful tirade. So which should you do, and when? The first thing to do is consider whether it makes sense to share you thought or hold your thought. Some opinions are better left unsaid if all they’ll do is hurt someone. So if you decide to share your opinion, should you be enthusiastic and passionate? Or calm and measured? 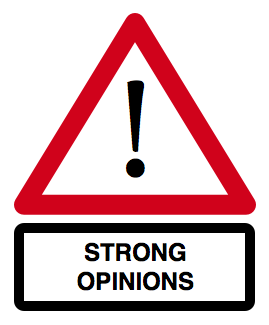 If you feel very strongly about your opinion, you may decide to share it enthusiastically. You state it with passion, because it is a very strong belief. It’s like a tidal wave, crashing to shore with incredible force! There are times when it makes sense to share your opinion with this much fervor. With friends who agree with you about how awesome the Minions movie was, be enthusiastic! But if you are too enthusiastic, or too enthusiastic at the wrong time, you may have become “overzealous”—spending an extreme level of energy expressing a belief. You could anger or bother the people around you. So if being too enthusiastic is a problem, what’s the alternative? Being measured. This is like calm waves on the ocean, moving slowly and evenly. Being measured is when you share your opinion in a calm and reserved way. When talking about a controversial topic, or with someone you don’t know well, it is often helpful not to share too enthusiastically. But as with all things, being too measured can be a problem, too. People may think that you don’t care about your opinion. Being too measured could be mistaken for indifference. In those cases, other people in a group may make decisions without you, because they assume you don’t care. For example, don’t let your team at work decide everyone needs to come in an hour early if you have a very long commute and can’t make it! There are a lot of choices in between too enthusiastic and too measured. When having discussions in a group, consider just how enthusiastic or how measured to be when sharing your opinion. Remember that sharing opinions has an impact on other people: it can make them uncomfortable, angry, or disappointed. OR it can make them interested, curious, inspired, or constructively challenged. And other people’s reactions all come back to you! Balance Challenges are only useful if they help you make a decision. So let’s put this balance into action. A close friend? A classmate you sort of know? A principal or boss? What topic is being discussed? Is it something silly, like a comedy TV show? Or something serious, like a controversial political controversy? How do the others feel about the topic? Do they agree with you, or have the opposite opinion? Do they feel strongly or not care so much? Do you even know?? With (1) classmates who you’ve only known a month, everyone is discussing (2) the novel, The Fault in Our Stars, that you’re all reading, and there’s wide disagreement about (3) whether the character is acting selfishly, which you believe – then, it may be best to share your opinion in a balanced way, but lean a little bit toward enthusiasm. With (1) your uncle who’s visiting from out of town, who you only see once a year, your family is discussing (2) the presidential election, which (3) your parents and uncle feel passionately about, and differently than you – probably best to lean toward measured, maybe around 80/20. With (1) some close friends who you know well and see often, they’re discussing (2) My Little Pony, which (3) you know everyone with you enjoys like you do – you can probably be 95% enthusiastic! This could be a helpful balance for everyone to consider. Autistic folk often have a hard time evaluating their audience and adjusting their communication accordingly. But neurotypicals make this mistake regularly, like my AppleWatch friend! And this is a lot to think about – if you’re not sure or can’t figure it out in time, you may want be play it safe and start measured. ← When is Rude Really Rude? Fuggedaboutit!